"A family tradition for over 70 years, this recipe has ruined me for all other dressing. I can't eat anyone else's! Serve with giblet gravy." Place chicken, 1 onion, 2 stalks celery, and salt in a large pot with enough water to cover. Bring to a boil. Reduce heat, and gently boil 90 minutes, or until chicken meat falls easily from the bone. Drain, reserving broth. Chop chicken, and set aside. 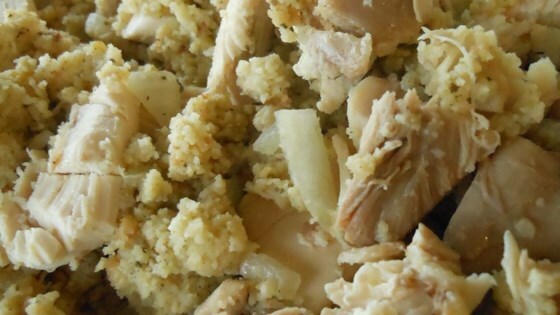 In a large bowl, mix crumbled cornbread, crumbled biscuits, 2 cups celery, 2 large onions, sage, poultry seasoning, seasoned salt, and red pepper. Stir in eggs and reserved chicken broth. The mixture should be very thin. Transfer mixture to the prepared baking dish. Bake 45 minutes in the preheated oven, stirring often. Mix chicken into the dressing mixture. Continue baking 15 minutes, until lightly browned. This rich Southern dressing includes chicken and eggs.